How many people from each country climb Africa's Highest Mountain each year? 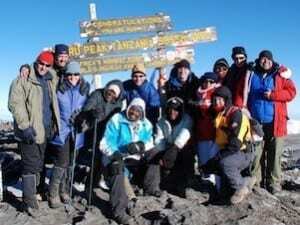 Home » Statistics » Which nationality climbs Kilimanjaro the most? Which nationality climbs Kilimanjaro the most? Once again I am very grateful to the Kilimanjaro National Park Authorities, KINAPA, for supplying the most up-to-date statistics available for which nationalities climb Africa’s highest mountain the most. I’m not sure how reliable they are, but they are the best we can get; plus, to be fair, on this matter at least they do seem to conform to my own impression of which nationalities you see most often on Kili. The following are the figures for 2016 – the latest figures available for the mountain. The first thing to note is that there are fewer people climbing now than five years ago when, in 2012, a total of 57,456 people attempted to reach the summit of Kili. Ever-increasing park fees, the addition of VAT to those park fees, concerns about terrorism (which is unfair on Tanzania, which has seldom been the target of terrorism, though its neighbours, and in particular Kenya, certainly have) and a downturn in the economic fortunes of several countries that usually send a lot of trekkers to Kili (such as the UK) have probably all contributed to this decline in visitor numbers. Bad news for those who make their living from the mountain, of course, though some of us will be pleased that there are fewer people climbing – the trekking companies will disagree, but over 57,000 people on the mountain in a year is, we think, just too many. As for which countries they come from, I suppose these figures hold few surprises for those who know the mountain. In general Americans don’t travel as much as Canadians, Europeans and Antipodeans but for some reason they love Kilimanjaro, a passion that I can only ascribe, maybe, to the ‘Hemingway effect’, his books doing much to publicise the mountain in his native country. Brits, of course, have a colonial connection to East Africa and are great travellers, and the same description can be applied to the Germans. The emergence of the new economic superpowers, in particular China, appears to be reflected in their figures, too, and is one of the few countries to have increased the number of people it sent to Kili (from 772 in 2012). It’s noticeable, too, that Russia feature for the first time, sending 712 people to Kili. This can be ascribed, we believe, both to the country’s increasing economic performance and, perhaps more importantly, the work of Altezza, the first Russian-speaking trekking agency for Kili and one that does much to advertise the mountain in that country. Incidentally, you’ll notice that, apparently, 905 people came from ‘British Indian Ocean’. These are a tiny huddle of islands in the middle of the sea halfway between Tanzania and Indonesia. The only inhabitants these days are US and British military personnel and associated contractors – a total population of about 2500; as such, we believe that – unless a third of the the population moved en masse to Tanzania to try to conquer Africa’s highest mountain – that this is a mistake, and the people who declared that they are from British Indian Ocean are actually just British. It doesn’t alter the UK’s position in the above table either way. I am a little obsessed with Mount Kilimanjaro. Since writing the first edition of the Kilimanjaro guide in 2001 I have climbed the mountain more than 30 times and occasionally leads treks up the mountain myself. And when I'm not in Tanzania researaching for the next edition of the guide (the fifth edition was published in 2018), I can be found living near Hastings, England, updating this website (which was first published in 2006), writing about the national trails of England, answering Kili-related emails and putting on weight. Friends describe me as living proof that virtually anybody can climb Kilimanjaro. Who has climbed Kilimanjaro the most? So which nationality climbs Kilimanjaro the most? ...And a lot less expensive than you'd think! - What's the best trekking company for my budget? - What safari should I go on after my trek? - Will my dietary requirements be catered for? Whatever your question, JUST ASK I'm happy to help! New edition of the Kilimanjaro guidebook in the shops now! What’s the best beer to celebrate your Kilimanjaro climb with? Where is the best place to take a photo of Kilimanjaro? What’s the best campsite on Kilimanjaro? Is it possible to climb Kilimanjaro independently? Climbing Kilimanjaro in the rainy season – is it worth it?